This is the third in a series of three posts by Harvard graduate student Yuan-Sen Ting. You can read the first post in the series here and the second post here. For more information and interactive demonstrations of the concepts discussed here, see the interactive online software module he developed for the Harvard AY201b course. Yuan-Sen is a first-year graduate student in astronomy at Harvard University. He is working with Dr Alexey Vikhlinin and Prof. Christopher Stubbs to study the evolution of the Universe by looking at the relative separations in distance between clusters of galaxies using the Chandra X-Ray Observatory. It has been argued that star-forming galaxies have to be the dominant source owing to the fact that there are not many quasars in the early Universe. The Sloan Digital Sky Survey (SDSS) has shown a steep decline in the number of quasars after its peak at z=2.5. If most quasars formed after this epoch, could they play a significant role in the reionization of the Universe, which seems to have completed as early as z∼6? Taking a closer look at this problem, Faucher-Giguère et al. (2008) made an independent estimate of the photoionization contribution from quasars. Only quasars produce the very high energy (∼50 eV) photons necessary to doubly ionize helium. Therefore, the luminosity of sources at ∼50 eV can directly tell us the contribution from quasars. Extrapolating to the lower energies relevant to hydrogen ionization, they show that at most 20 percent of these photons could come from quasars. Besides showing quasars cannot be the main suspect, Faucher-Giguère et al. also use the Lyman alpha forest to derive the star formation rate indirectly. We have discussed in our first post that the absorbers are in photoionization equilibrium. With this assumption, the authors use the Lyα optical depth to derive the photoionization rate at different redshifts. They then infer the star formation rate in galaxies at different times in the history of the Universe. The figure below shows that the derived hydrogen photoionization rate is remarkably flat over the history of the Universe. This suggests that there should be a roughly constant photoionizing source over a large range of cosmic history. This is only possible if the star formation rate in galaxies continues to be high in the early Universe, at high redshift (z∼2.5 — 4), since the contribution from quasars only begins at this redshift. 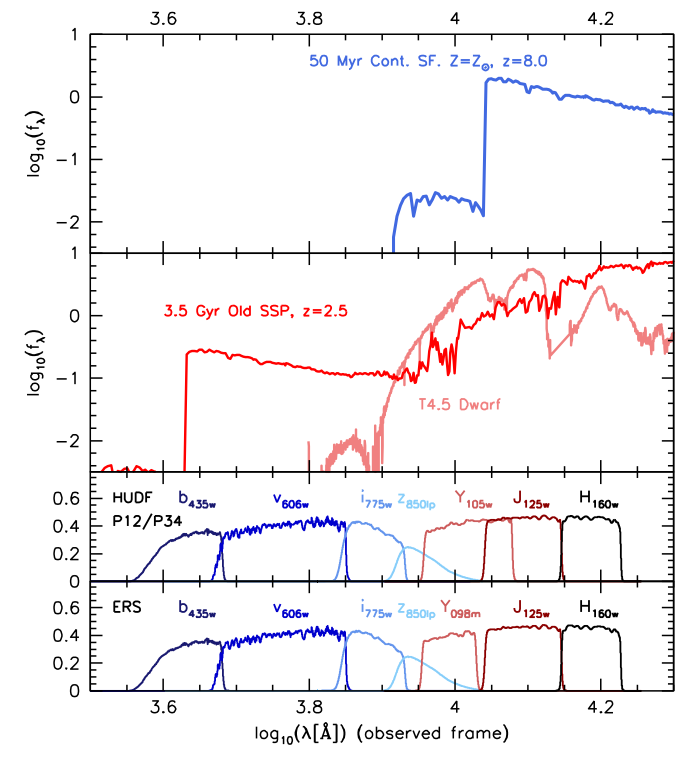 As the figure shows, such a star formation rate is consistent with the simulations of Hernquist & Springel (2003). Observations of the hydrogen photoinization rate compared to the best fit model from Hernquist & Springel (2003). This suggests that the combination of quasars and stars alone may account for the photoionization. Adapted from Faucher-Giguere et al. (2008). But there is another way to trace the history of star formation — by directly counting up the number and size of galaxies at different redshifts, using photometric surveys. It turns out that the results from these direct surveys, as performed by Hopkins & Beacom 2006 for example, are in tension with indirect approach. The photometric surveys suggest that the star formation rate decreases after z>2.5, like in the figure below. This result says that both the major photoionization machines (quasars and stars in galaxies) would be in decline after z>2.5. Like the figure above, but now using the models of Hopkins & Beacom (2006) where the star formation history is inferred from photometric surveys. If the photometric surveys are right, Faucher-Giguère et al. strongly suggest that the Universe could not provide enough photons to reionize the intergalactic medium. So why are there two different observational results? 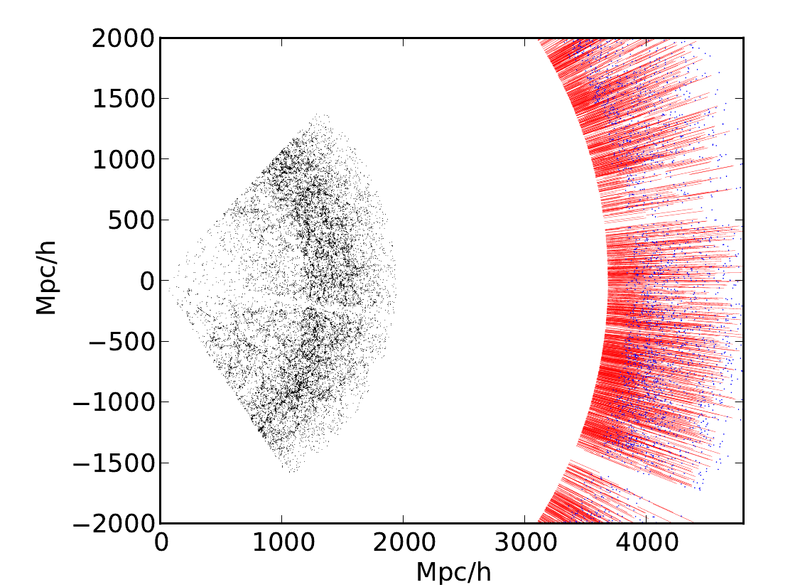 The star formation rate of galaxies at high redshift. We cannot observe galaxies that are faint and far away. How many photons could they provide? Submillimetre observations in the near future could shed more light on this due to their ability to observe gas and dust in high redshift galaxies. How concentrated is the material surrounding the galaxies? This factor could affect the fraction of ionizing photons escaping into the IGM. In short, it is possible that star formation did indeed begin way back in the cosmic history, at z>2.5, but we underestimated it in the photometric surveys due to these uncertainties. In this case, all the results from simulations, Lyα forests, and photometric surveys could fit together. The non-detection of the Gunn-Peterson trough demonstrated that the IGM is mostly in an ionized state. The Lyman alpha forest gives us a 3D picture of the IGM. Cosmic microwave background (CMB) polarization suggests when the process of reionization began, and shows that reionization is a process extended in time.